Ministry of Health chief of health services Dr Charles Mwansambo says government needs evidence-based research to inform its policies as the health sector continues to face challenges in treating both communicable and non-communicable diseases (NCDs) such as diabetes, hypertension and road traffic injuries. 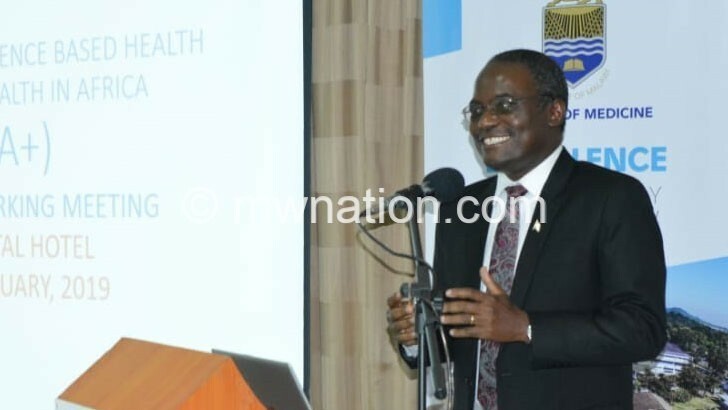 He made the remarks in Lilongwe yesterday during the official opening of the second annual Collaboration for Evidence Based Health Care and Public Health in Africa (Cebha+) networking event. Mwansambo said the meeting serves as a guideline for policymakers to know what to do as they need evidence before coming up with strategies to deal with the disease burden and mortality rate from NCDs. The network intends to translate principles of evidence-based public health by ensuring that priority research questions are relevant and conducting robust research and overcoming the disconnect between primary research, evidence synthesis and implementation into policy and practice. Cebha+ African coordinator Harriet Mayanja said the meeting will help them identify successes and challenges partner countries face in dealing with NCDs. Mayanja added that the aim of the collaboration is to come up with interventions to prevent, screen and treat diabetes and hypertension and also interventions to prevent road traffic injuries. Cebha+ Malawi representative Tamara Phiri said it is important when countries with the same health challenges come together to discuss how they can deal with major NCDs that are claiming many lives.